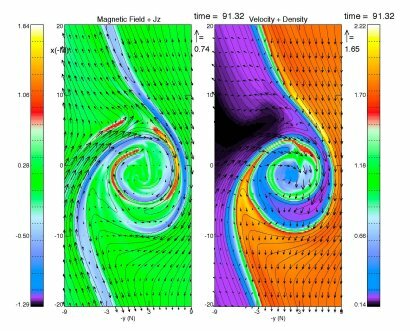 On 20 October 2006, a team of European and American scientists revealed the presence of magnetic reconnection within giant swirls of plasma of ~40 000 km size on the flank of the magnetosphere. These giant swirls were identified to be the result of the Kelvin-Helmholtz or 'wind over water' instability and were shown to facilitate the transport of solar wind material into the magnetosphere. This result improves our knowledge on how, where and under which conditions the solar wind manages to penetrate the Earth's magnetic shield, thanks to data collected by the four satellites composing the ESA/NASA Cluster mission. The Earth's magnetic field protects our planet from the continuous stream of particles blown by the Sun: the solar wind. However, there are ways for solar material to penetrate the Earth's magnetic shield or magnetopause. One of the most efficient mechanisms for such solar wind penetration is magnetic reconnection. At the magnetopause, it occurs when Earth's magnetic field lines interconnect with Interplanetary Magnetic Field (IMF) lines carried by the solar wind. This allows solar material to enter along the connected field lines (Animation 1). The Earth's magnetic field lines are always oriented from the South to the North poles and are static. In comparison the IMF is rather dynamic, changing orientation frequently. When the Bz component of the IMF is oriented southward, the IMF is anti-parallel to the geomagnetic field lines at the subsolar point (the 'nose' of the magnetopause facing the Sun). In this case, magnetic reconnection can readily account for solar wind entry at the dayside magnetopause. With a Bz component of the IMF oriented northward, reconnection at the dayside magnetopause is highly unlikely. However, measurements in space have shown that the plasma content of the outer magnetosphere increases during northward IMF, contrary to expectation if reconnection is the dominant transfer mechanism. Under northward IMF conditions, the characteristics of the heart of the magnetosphere, a region called the plasma sheet, located around the Earth and extending significantly on the Earth's nightside, are significantly modified. Only a couple of hours of Northward IMF conditions are necessary for such a transition, where in-situ satellite observations show that the plasma sheet is cooler and denser than compared to the situation when the IMF is southward. Under these northward IMF conditions, the plasma sheet is referred to as the cold and dense plasma sheet. But what is behind its formation? Different mechanisms have been proposed. One of them is the Kelvin-Helmholtz or 'wind over water' Instability (KHI), and occurs when two fluids are in motion with respect to one another. In the magnetospheric environment, this situation is most likely to occur on the magnetospheric flanks. According to simulations, plasma transport across the magnetopause is possible if the KHI has developed enough to form rolled-up vortices, or giant swirls, able to engulf plasmas from both sides of the magnetopause (Image 1). The plasma transport itself is ensured by either the collapse of the vortex or the reconnection within such a vortex. Image 1. 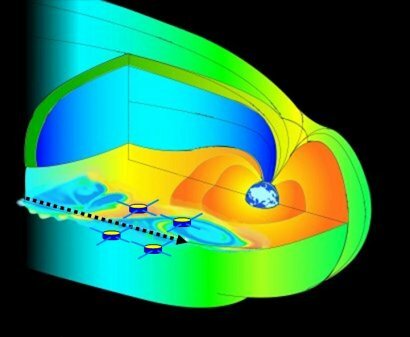 This figure shows a three-dimensional cut-away view of Earth's magnetic bubble called the magnetosphere. 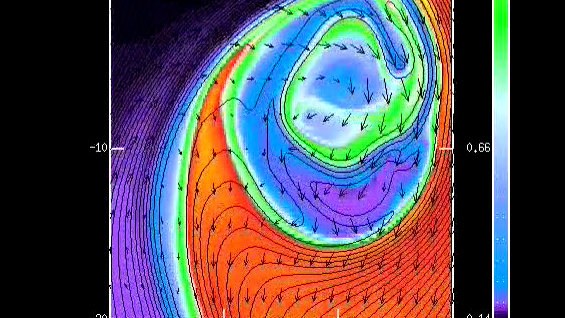 The curly features sketched on the boundary layer are the Kelvin-Helmholtz vortices on the dawnside of the magnetosphere discovered by Cluster [Nykyri et al., 2006]. They originate where two adjacent flows travel with different speed. In this case, one of the flows is the heated gas inside the boundary layer of the magnetosphere, the other the solar wind just outside it. The black dashed arrow shows the trajectory followed by Cluster. This theoretical mechanism was proposed in the 1950's by Jim Dungey from Imperial College (London, UK), just before the space era. Many encounters by spacecraft of vortex-like structures near the magnetopause have been reported since and interpreted as signatures of the Kelvin-Helmholtz instability and compared to numerical simulations (see in particular Fairfield et al., 2000; Otto et al., 2000). However, observations by a single satellite do not allow for the full characterization of these KHIs: are the observations of a large amplitude wave structure or has the system developed to the unstable state where rolled-up vortices have formed? The ESA/NASA Cluster mission is the first mission of the space era composed of four satellites flying in formation able to tackle such problems. Launched in 2000, the concept proved successful. On 12 August 2004, Hiroshi Hasegawa and colleagues from New Hampshire University (USA) published in Nature the first detection with 4 spacecraft of rolled-up Kelvin-Helmholtz vortices on the dusk side of the magnetosphere. In particular, the length scale of one of these vortices was estimated to be 40 000 km - 55 000 km, thanks to the use of Cluster data [see related links on the right-hand side for the related ESA science news release of August 2004: http://www.esa.int/esaSC/SEMTMDW4QWD_index_0.html]. However, no sign of magnetic reconnection or vortex collapse was found. On 3 July 2001, the four Cluster satellites were flying in formation along the dawn side of the magnetosphere when they observed large variations in all plasma parameters. Dr. Katariina Nykyri from Imperial College conducted a detailed study on these data and linked these large variations to the presence of rolled-up Kelvin-Helmholtz vortices. But this is not just another encounter of giant swirls of plasma induced by the KHI. For the first time, the presence of magnetic reconnection was identified within such vortices. Numerical simulations in 2 dimensions (2-D), conducted by Nykyri and colleagues, were able to reproduce the Cluster observations in great detail and in particular, to show the presence of magnetic reconnection (Image 2 and Animation 2). Published 20 October 2006 in Annales Geophysicae, this study reinforces the importance of this mechanism to enable solar wind material to penetrate the Earth's magnetopause. Image 2. MHD simulation result of the KH wave at t=410 s. The magnetic field (arrows) and the z-component of the current density Jz (colour coded) are plotted on the left panel. The right panel represents the velocity (arrows) and the density (colour coded). The black lines are magnetic field lines. But this story is not over yet. To better understand the importance of this phenomenon, further simulations, this time in 3D, are now planned. "In 3-D simulations, we will study the significance of plasma transport due to this mechanism and its effectiveness in the formation of the cold and dense plasmasheet on this day", wrote Dr. Nykyri research associate at Imperial College at the time of this study, now assistant professor in Physics at Embry Riddle aeronautical University, Florida, USA. B) later the reconnection develops in a magnetospheric current layer generated by twisting of the magnetospheric field due to the KHI. Another crucial point is to perform a statistical study of the occurrence of the KHI on both flanks of the magnetosphere, in order to quantify the importance of this phenomenon. The goal is simple: for given solar wind conditions, how much solar material data will swirl down into the magnetosphere via the Kelvin-Helmholtz instability. This requires digging into the 6 years (and counting!) of data accumulated by Cluster. "Cluster data are public domain. An on-going effort is financed by the European Space Agency to make it available online with the highest time resolution and quality. The so-called Cluster Active Archive (CAA) is accessible at http://caa.estec.esa.int/ [see related links on the right-hand side]. We are building a gold mine of magnetospheric data and we invite the whole world to use it", says Philippe Escoubet Cluster project scientist of the European Space Agency. Fairfield, D. H., A. Otto, T. Mukai, S. Kokubun, R. P. Lepping, J. T. Steinberg, A. J. Lazarus, T. Yamamoto, Geotail observations of the Kelvin-Helmholtz instability at the equatorial magnetotail boundary for parallel northward fields, J. Geophys. Res., 105(A9), 21159-21174, 10.1029/1999JA000316, 2000. Otto, A., D. H. Fairfield, Kelvin-Helmholtz instability at the magnetotail boundary: MHD simulation and comparison with Geotail observations, J. Geophys. Res., 105(A9), 21175-21190, 10.1029/1999JA000312, 2000.